Through both parts of this story, I’ve been trying to figure out why I’m not more invested in the outcome. This has all the elements I tend to pick out out for praise: complex world-building, a morally challenging conflict, high stakes, and characters forced into conflict with people they care about. And yet, all of this lacked the energy and passion of the show’s best early episodes (one of which is coming up next). This could be due in some part to my own predilections; while I admire ambition, I tend to lose interest in stories in which the conflict is overly abstract, as it is here, despite the efforts to personalize the issue with the presence of Sisko’s old friend. But I think it comes down to a desire to tell bigger, more impactful stories without a willingness to entirely follow through. As two-parters go, this serves its purpose, and the second half has some excellent moments. It’s just, without any real consequence, the struggles we watch come off as slightly toothless. No one we care much about dies, or even changes their position. I understand why Calvin was brought in, but the reveal that he’s working with the Maquis doesn’t exactly sting, especially in comparison to Ensign Ro’s ultimate decision in “Preemptive Strike.” The politics of Sisko’s situation are fascinating, but only if the show can find a way to translate concept into tangible reality. As it is, we see a bunch of humans running around in generic Trek clothing acting aggrieved and shouting at each other, and then they lose. It’s hard to get all that worked up over their plight. Sisko is troubled by it, though, and his inner turmoil is one of “The Maquis, Part II”’s highlights. 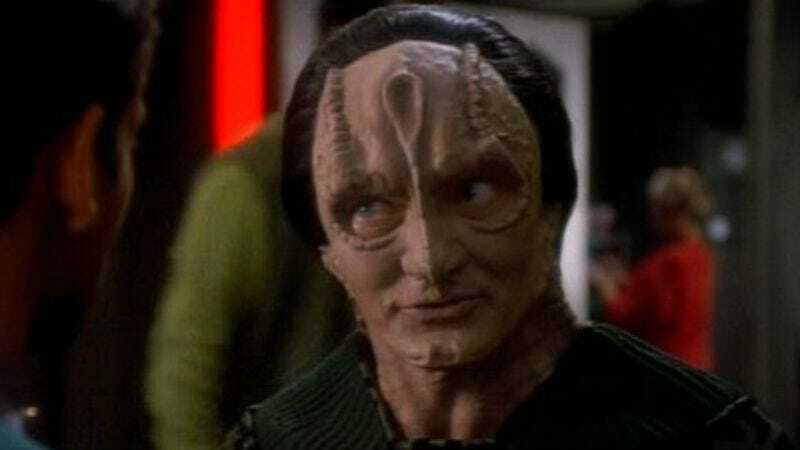 It’s easy to listen to the various grievances on the Cardassian and human sides and not care a whole lot; Cardassians are evil dicks, and we only see the humans after they’re past their breaking point, so they’re already stuck in a feedback loop of self-righteousness. But it gets to Sisko, and the fact that it bothers him means it matters more to us. As seems to happen in these big two-parters, external crisis helps serve to clarify and strengthen our understanding who Sisko is and what he stands for, and Avery Brooks is always excellent when the material gives him the opportunity. Last week, he spent most of his time seething and trying to get caught up on events as a problem threatened to spin out of control. This week, he’s still angry, but now he’s going to do something about it. He rescues Gul Dukat from his captors, he forces an agreement to stop weapon shipments to the Cardassian colonists, and he prevents a major Maquis attack, all of it through his own initiative and will. There was never any doubt that Sisko was right for his job, but after watching him get mocked by Dukat and fooled by his friend in the first part of this story, it’s gratifying to watch him make things work out in the best way he can. Not that any of it makes him feel much better. The show has given us situations without easy solutions before, and it always makes for effective drama; not only is it more realistic (which isn’t necessarily a good thing), it also leaves room for a more complicated response. Sisko sets out to prevent a war, and he accomplishes his goal. That doesn’t mean he’s happy about it. He sympathizes with the Maquis, and the fact that the episode’s climactic battle has him clashing with the colonists (as well as with his old friend) can’t feel right. As always, Starfleet is no help (Star Trek: The Next Generation fans will recognize the steely uselessness of Admiral Nechayev in her brief guest appearance), and, apart from Kira, no one is all that impressed at how ably Sisko balances the demands of his conscience and circumstance. But it gives us a reminder of just how suited Sisko is to the role which has been forced upon him. He can give impassioned speeches about the plight of the Maquis in one scene, and then face them down without blinking in another. He is not to be fucked with. The other highlight of the hour is once again the presence of Gul Dukat. Can I make a confession? I really like the Cardassians. I’m not sure I’d want to share a planet with them (or under them, as it were), but I’m a lot more fascinated by Cardassian politics than I am by the Bajorans’. When it comes to Bajor, the joy is in the individuals. Individual, really: Kira is terrific, and while she hasn’t had as much to do this season as she did in the first, she remains a vital, exciting element of the show. But the rest is, if not awful, then at least not all that thrilling. I’ve enjoyed the government squabbles and Vedek maneuvering, but at the same time, when Bajoran-centric episodes pop up, it sometimes feels like I’m being forced to eat my vegetables. This is the not the case with the Cardassians. Not every Cardassian storyline has been gold, but their culture is more clearly defined (Bajor tends to be “sort of religious”), and, because they’re the bad guys, they get to be more aggressive and trickier and, on the whole, more fun to watch. Garak is the show’s best non-ensemble character (and one of the show’s best characters period), while Dukat continues to blossom into a reliably fascinating opponent, and even the incidental Cardassians we’ve run into have been striking and creepy as needed. While Bajor struggles to rebuild and find its voice, Cardassia gets to run around forming secret plots to undermine the Federation and manipulate its old enemies, while operating under a government which could charitably be referred to as “strict.” If either of these places were real, I’d know which one I’d want to visit (hint: it’s the one without oppressive restrictions of personal freedom and enforced devotion to the state), but they aren’t, and that means I’d much rather hear about Cardassian aggression than Bajoran passivity. Thankfully I’m in luck, because Gul Dukat gets, if anything, even more screen time in part two than he did in the first half of the story. First we see him mocking his captors for their basic inability to torture information out of him (Sakonna tries for a mind-meld, but Dukat manages to block her). Then, when he learns from Sisko that the Cardassian government has thrown him to the wolves, he teams up with the DS9 personnel to help find a resolution to the situation that won’t end in outright war. As entertaining as the Gul is throughout, the real fun here is watching him and Sisko play off each other again, and the smart way the episode uses Dukat to both demonstrate Sisko’s cunning, and show where he draws the line. After watching the Cardassian run rings around him last week, Sisko is able to force Dukat to do his bidding this time around; the Cardassian government (in the form of Legate Parn) attempts to pin the weapon shipments on the kidnapped Dukat, which means the Gul doesn’t look quite as sharp as he once was. Add to this the fact that Sisko goes out of his way to rescue the man, in a situation where, were their positions reversed, Dukat would’ve almost certainly left him to rot, gives Benjamin a curious sort of edge. It’s easy to mistake decency for cowardice or weak-will, but Sisko demonstrates how committed he is to maintaining his own ideals by sticking to them as much as possible. He rescues Dukat (which is part a diplomatic coup, but also just the right thing to do), and, when faced with his old friend Calvin, chooses to let the other man go after preventing him from reaching his objective. Dukat views this as a weakness, because of course he would; to a Cardassian, the only good enemies are dead ones, and the only good friends are the ones you haven’t caught yet. But Sisko is in an impossible position, and while Cal himself never registers all that strongly, the grief his betrayal inspires does. Sisko’s decision not to kill his friend feels earned; he makes the decision, one suspects, as much for the sake of his own soul as for Cal. It’s too bad, then, that the rest of the episode doesn’t live up to its best moments. As usual in the second season, there’s nothing embarrassing; in reuniting Quark and Sakonna, the hour even manages to partially redeem the pair’s creepy encounters in “Part I,” as Quark uses logic to point out to Sakonna the inherent stupidity of her choices. Yet Sakonna isn’t much of a character, and as fun as it is to see Quark turn Vulcan logic against her, it’s hard not to wonder just what the point is. Including a Vulcan with the Maquis should have some kind of meaning, but it doesn’t, and we never get a strong sense of how she got caught up in all this mess. A small criticism, to be sure, but it’s relevant to the episode as a whole, because it’s with the Maquis themselves that the show’s ambition fumbles. We’re told the Federation colonists are suffering under Cardassian rule, we’re informed that this suffering drove a section of them to form a group capable of fighting back, but none of this back-story ever lands. The episode gives us Calvin as a sort of all-purpose symbol, figuring both as reminder to Sisko of his Starfleet past and his duties, as well as giving us a supposed emotional connection to the Maquis. But it’s not enough, and Calvin himself is never more than a generic figure of betrayal. The biggest sin this story commits is spending too much time telling us to care instead of forcing us to. It avoids being a slog because it has some good ideas and good performances, but it’s hard to escape the malaise of a missed opportunity. If I was grading these, the sight of Odo turning his arm into a tentacle to grab one of the Maquis would’ve definitely been worth half a letter grade at least. “On Cardassia, the verdict is always known before the trial. And it’s always the same.”—Dukat, explaining the Cardassian legal system. Dukat: “Commander, thank you for coming to my rescue.” Sisko: “I’m sure you would have done the same for me.” Then he laughs. I tend to take people at their word. It’s not because I’m honest or because I’m a better person or whatever. It’s because, for me, the idea of expressed self-identity is so crucial to how I view myself in the world that I can’t imagine someone pretending to be someone else. I can understand the concept; I can understand trying to cover up a crime or trying to make yourself look better. But intentional, generalized obscurity will always surprise me. In real life, this can be painful; in fiction, it can be superb. Although even then, the balance is tricky, because fictional characters whose motives shift too often expose themselves as tools of the writers, useful primarily because they fit any narrative hole. This happens on TV shows a lot, although I’ll be damned if I can come up with a specific example. (Much as I loved the series, half the cast of Battlestar Galactica seems to fit in this category at various times.) Character complexity is a welcome, and frequently powerful, concept. Character convenience is not. Which is just one of the reasons I’m so impressed by “The Wire,” which is just plain terrific. The episode hinges on Garak, and, more to the point, the multiple layers of deceit and obfuscation Garak has built up around himself over the course of his life. By the end of the hour, the details of the former (?) spy’s past are present, but obscure, like words read in a dream. This could have been immensely frustrating, and yet, as it’s handled, it’s entirely consistent with what we do know about Garak as an individual. More, even though I can’t say for sure how he was exiled from his home planet, you get enough of the story that you feel like you know the important parts. Bashir’s friendship with Garak has always been one of the most interesting things about him, and “The Wire” uses that friendship to great effect. In the past when we’ve seen the two of them together, Garak has always served as the wiser, more powerful figure. He knows more about what’s going on than Bashir, and his guidance is necessary to keep the doctor moving forward. Their roles are somewhat reversed in this episode, however. In the cold open, the two are wanting to have lunch together when Garak is overcome by an attack of—something. Bashir expresses concern, and Garak puts him off, but the doctor isn’t fooled. Displaying the sort of pushy benevolence which appears to be common practice among Starfleet personnel (it must have something to do with the sense of entitlement that comes from not needing money to do anything), Bashir starts asking questions and looking into Garak’s medical records. He and Odo spy on Garak making arrangements with Quark to try and purchase some high level, classified Cardassian bio-technology. Finally, when the attacks become too severe, Bashir confronts the tailor, and that’s when things get really interesting. As for just what he’s accepting… “The Wire” is my favorite episode of DS9 since “Duet,” and it shares with that earlier entry a series of shifting understandings. Comparatively early, we learn that Garak has an implant in his brain, so we think, like Bashir, it must be some sort of punishment device. But that’s not exactly right; Garak explains to the doctor that he received the implant when he was given a certain piece of information during his work for the Cardassian spy organization known as the Obsidian Order, information so crucial that he needed to be able to absolutely guarantee he would not reveal it to others, not even under torture. The wire in his brain is designed, in moments of great stress and suffering, to send waves of endorphins into his brain, literally translating pain into pleasure. This renders any “enhanced interrogation techniques” ineffective, but it also gives him access to a potentially addictive substance locked into cerebral cortex. Garak is a creature of discipline and focus, but his exile from Cardassia has become more and more agonizing for him, turning his time on Deep Space Nine into daily sessions of misery and despair. So he started triggering the device in his brain to help him get through the day, and that helped for a while, only he had to use it more and more often, and then it went haywire and now he’s hooked on something that will kill him, and soon. It’s a brilliant concept, one that manages to subvert our expectations while at the same time living up to them. Garak has a wire in his head? Oh, it must be some sort of evil Cardassian punishment—but it isn’t. It’s something worse. Just the idea of modifying one’s neural chemistry to turn agony into ecstasy is unsettling, and it fits in beautifully with all we know about Cardassia and its ways. Everything comes down to control; everything is about reducing weakness, and conforming the individual to the needs of the state. If something as fundamental as the body’s way of warning itself of injury can be changed, even reversed, there’s no real limit to what they can do next. Eventually, 2 + 2 really will equal 5. The episode doesn’t end there, either. Garak tells Bashir he was exiled for destroying a passenger transport with a high-level Cardassian official’s daughter on bored, almost daring Bashir to leave in disgust. But the doctor stays on, convincing the tailor he needs to go cold turkey or die. This gives Bashir another chance to prove his worth, first defending Garak against Odo’s curiosity (since Garak was part of the Obsidian Order, Odo assumes he’s either responsible for some unsolved murders on his books, or else he knows who was responsible), and then standing by his friend as he suffers through the agonies of withdrawal. Garak doesn’t make this process easy, either. We learn another version of How I Got Exiled From The Only Home I’ll Ever Know, only this time he says he allowed some Bajoran children to escape during an interrogation, because he couldn’t bear to see them suffer. Later, he’ll suggest he tried to frame this decision on an aid named Elim, except it turns out that Elim is, in fact, Garak’s first name, so what does all of this mean? Is he a murderer? Well, yes, he’s a murderer, but was killing the wrong person the reason he was sent away? Or was it some momentary show of compassion that doomed him? I’m not exactly sure, and yet, it’s not hard to understand just who Garak is after watching this. The details matter less than the way he tells them, the self-loathing so thick in his voice it drowns out his trademark chirrupy sarcasm. Imagine you’ve spent your whole life in a totalitarian state, and you’ve devoted that life to advancement, obedience, and devotion. And also imagine you are very, very good at your work. You rise in position, you find a coveted role in the halls of power and you are groomed to one day rise to be the highest in the land, and every day, you feel something like a conscience warning you to stop. Or maybe you don’t. Maybe you’re so committed to the glory of all that you don’t have time for morality or decency or implications. Only one day, something happens. Some mistake, some slip in your otherwise perfect control, and that’s all it takes. Or maybe you’re not even the one who makes the mistake; maybe it’s a co-worker. Either way, it’s the end of your rise, the end of your golden-child status, and without apology, you are sent on your way, so despised by the mentor who once loved you that he hopes you live a long, miserable life. You’re sent away to a place where half the people hate you, and the rest don’t trust you, and you brood as the hours and days pass, because you can’t understand what happened. The behavior which threw you into exile is the one thing you ever did that the people around you would praise you for, and yet embracing it, embracing that minor miscalculation of mercy, would mean abandoning everything in your life which has meaning. So you’re crafty, and you’re a little wiser than you were, but you’re still trapped, because you’re compromised no matter which direction you turn. That’s probably not exactly it. At the very least, the revelation that “Elim” never existed (at least not in the way Garak describes) shakes up the narrative. I think that’s the spirit of it, though, and the idea that the Obsidian Order outcast is screwed coming and going makes sense to me. 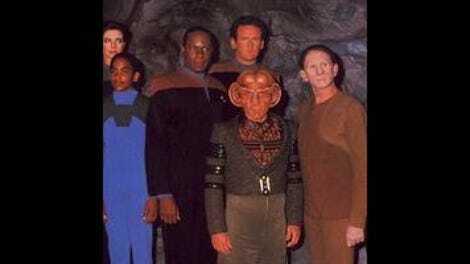 I’m not sure if we’ll ever get a clearer picture of why Garak is in the position he’s in, but either way, I’m happy. We know enough about his past now to know why his smiles always seem just a little too wide, and to get a sense of who’s hiding behind all that casual conversation. You want to know the difference between a good episode and a great one? Okay, there are a lot of different answers to that, but for one: in a good episode, Garak’s explanation about his brain implant would’ve been the climax. Here, it’s a signal that the games have begun in earnest.